Realtime video effects and graphics compositing tool. Is there a better alternative to PixelConduit? Is PixelConduit really the best app in Video category? Will PixelConduit work good on macOS 10.13.4? PixelConduit is a realtime video effects and graphics compositing tool for the Mac. It's the "Swiss Army knife" of visual effects and live-video processing. Everything in PixelConduit is designed for realtime performance and high color precision. With its flexible user interface and advanced extension possibilities, PixelConduit is at home in any scenario that deals with video, whether it’s live effects, dynamic video installations, or post-production work like compositing and workflow automation. New node widget: MIDI Output. This node widget allows you to send controller data to a MIDI device. The input can be any values within the PixelConduit project. PixelConduit needs a rating. Be the first to rate this app and get the discussion started! PixelConduit includes over 90 different image-processing operations that support High Dynamic Range Imaging (floating-point color) everywhere throughout the rendering pipeline. 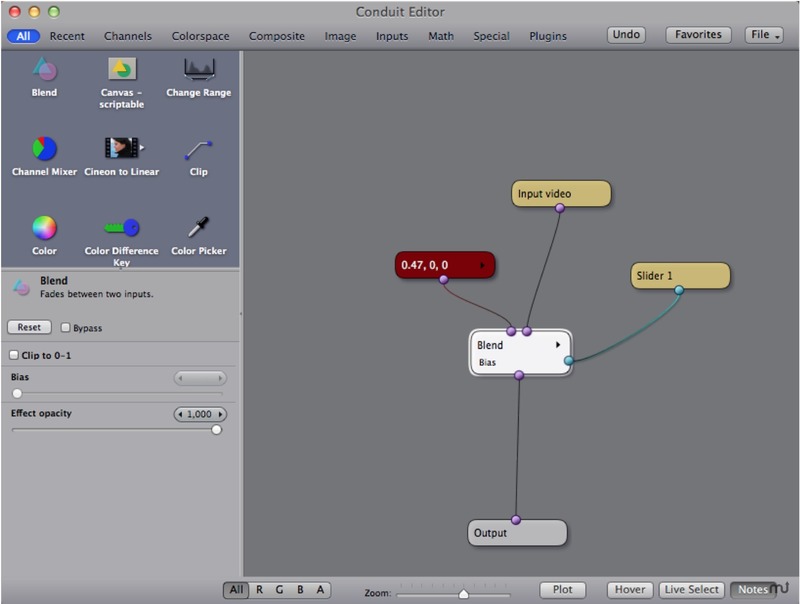 All the built-in tools such as blue/green screen keyers, various color correction tools and high-quality blurs can be combined without limitations thanks to the Conduit Effect System, a powerful node-based user interface. The Conduit Effect System has a unique node-joining capability that fuses complex effects together so that they can be rendered all in once on the computer’s GPU (Graphics Processing Unit). This means visual effects and composites can be rendered in realtime even with HD/2K+ sources. There's no limitation on resolution or frame rate, so it’s possible to mix NTSC, PAL, HD and any other sources. New node widget: Convert Video Pixel To Value. This is like an eydropper tool: it "picks" a pixel value within the input image, and outputs number values that you can feed to other node widgets. For example, you could use the pixel value within a video to control the intensity of a visual effect, to drive a hardware controller (e.g. with MIDI Output), etc. Many improvements and fixes to MIDI control in the Sliders and Controls window. There is now a log display in the Setup window that shows the received data from the device, which helps in troubleshooting MIDI problems. Fixed issue with the Web Video Server node widget where the stream produced by the server would not view correctly in Safari 6 (and other browsers that use Mac’s built-in WebKit framework).